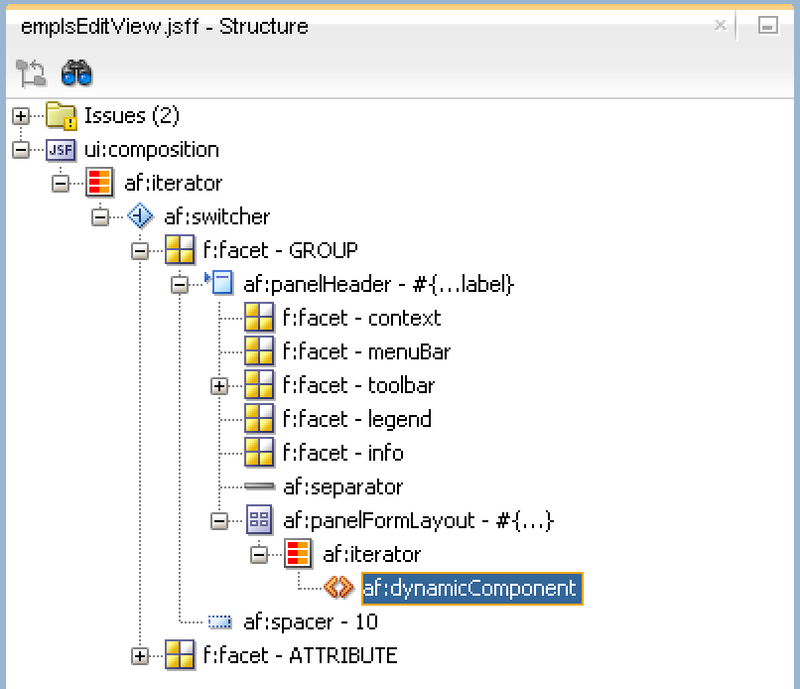 ADF 12c offers completely new way to implement UI forms. 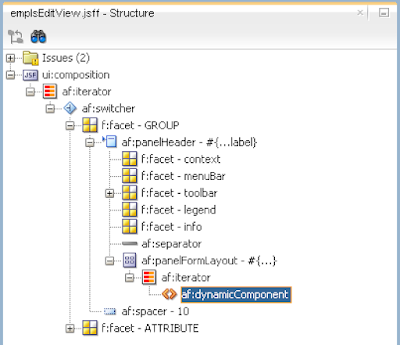 We can implement dynamic forms, based on static ADF BC components. Such approach could simplify form maintenance - when there will be changes in DB, developer would need to adjust only ADF BC EO/VO structure, without changing anything on UI. Bindings layers could determine data structure dynamically and dictate how to render UI blocks. 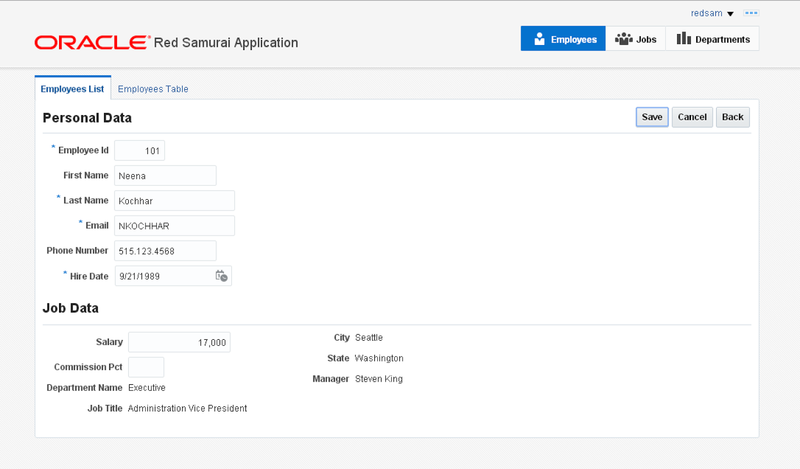 ADF BC VO provides special metadata option to define how form UI should be rendered - UI Categories. Through categories we could group attributes and this would help to render dynamic UI with separate blocks and proper order. I hope this post will give you some new ideas about robust ADF UI implementation. 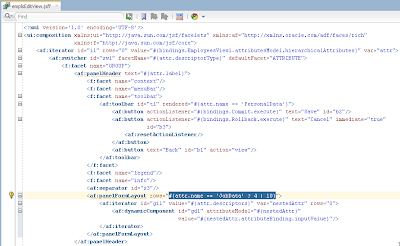 Download sample application - ADFAltaApp_v7.zip. 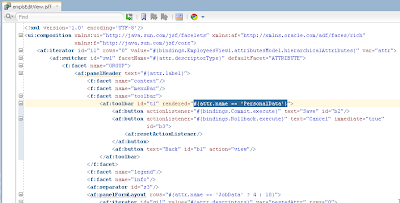 This is a very useful feature in 12C. But now since the components are rendered dynamically inside iterator using dynamicComponent tag, does this means we now can't use the various properties of the UI components which were earlier used to display attributes in form, like visible/render, binding,value and various other properties of say inputText component, which are helpful in achieving various functionality. 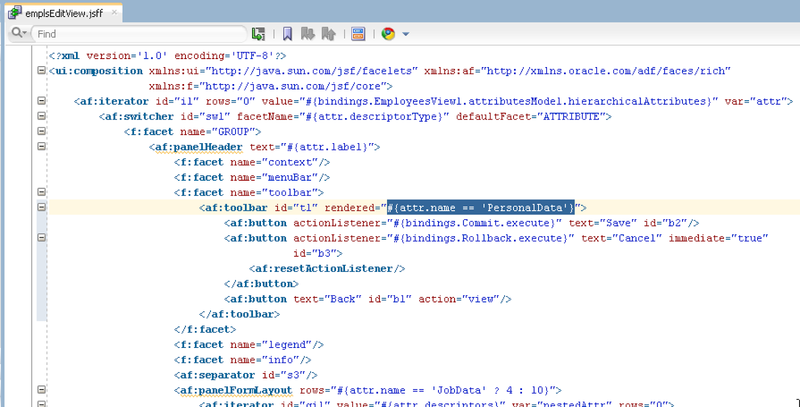 Also the ADF faces validators can't be applied? 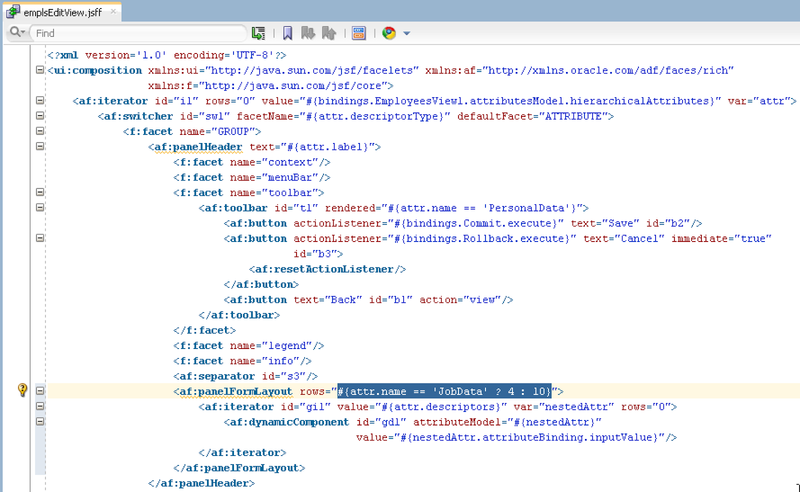 You can do all the things you describe through declarative component in 12c. It supports all properties of regular ADF Faces components. I mention this in the post. Need to have a dynamic form (he wants to create many form every day by himself in run time). And add some components in the run time. For example he can make today a form with group of input text and group of check box and table and tomorrow he need to make a new form with input text and radio and table also etc..,. This is wonderful piece of code for dynamic UI. 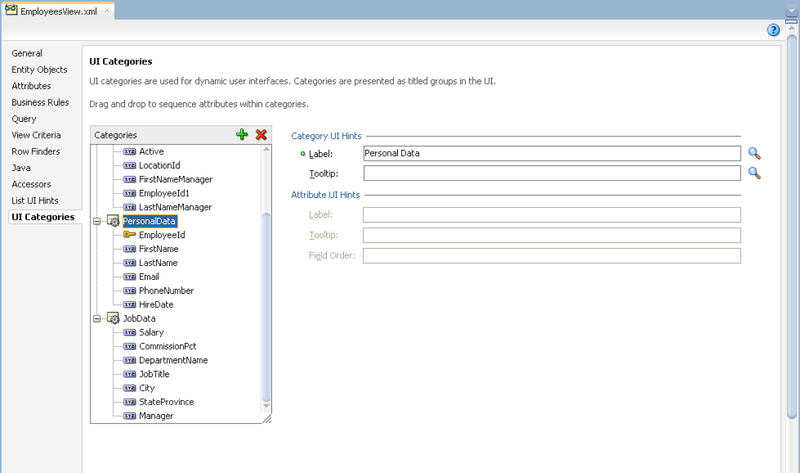 Also, is there way to customize the field order in the dynamic form. 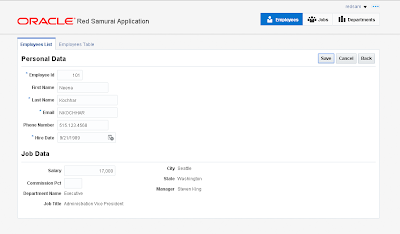 This example is based on dynamic ADF UI. Do you want to change order while rendering UI? Yes, different order for different user. 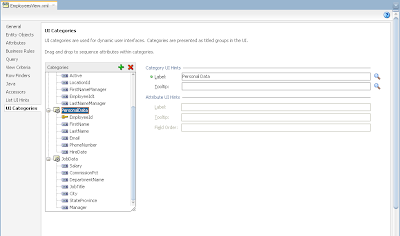 I dont have ready solution for this question, may be you could override categories implementation in ADF BC. I will need to check that. Should be possible. But I dont have example for your request. 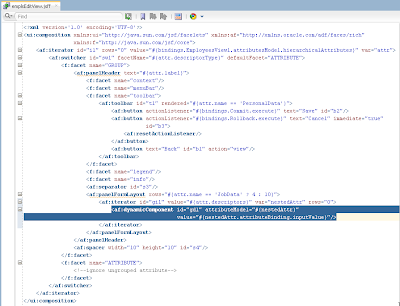 Where do you think I need to write code to over-ride field order.. should I try over-ride attribute hints... I see getFieldOrder.. 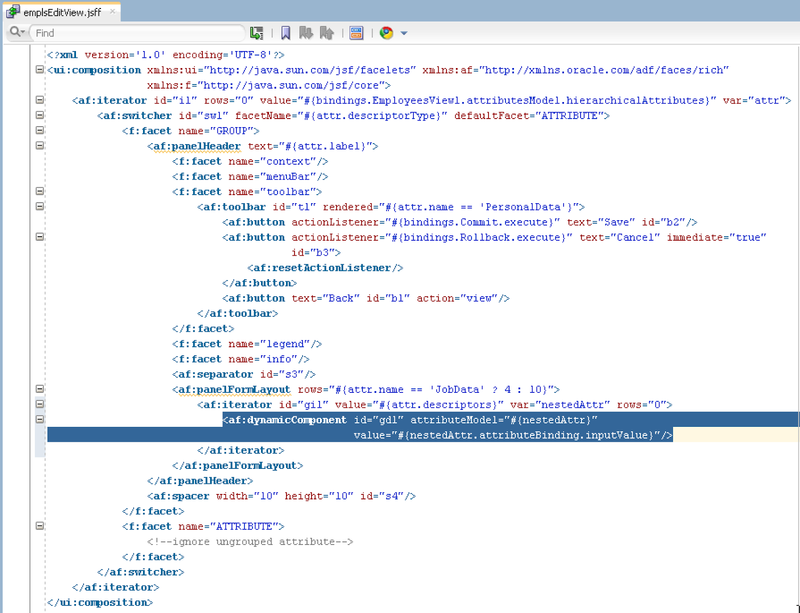 I dont see a setFieldOrder.. Also is there a way write a groovy expression in VO source to read from resourcebundle.. Please do point a starting point. really appreciate your help in this, Most of our programming problems were solved by your blogs. I will take a look into that, is on my todo list. Thank you very much. Really appreciate it. Did you get a chance to look into the filed order customization issue. Not yet, busy with questions from our projects. Its on my todo list, should be able to find time to solve it this or next week. It seems field order is coming from Attribute Definition. This means you can't have it different for each user, it must be same for all users. Can we not have a groovy expresion on the FIELD_ORDER schema properties value in the source XML of the VO and that groovy expression could bind to app resource bundle hash map which has a numeric value to FIELD_ORDER? If you want to reference dynamic value through Groovy, this post will be helpful - http://andrejusb.blogspot.lt/2016/04/adf-12c-custom-property-groovy-and.html It actually quite simple. Looks interesting.. Let me try and will keep you posted.